Ayurveda is based on the belief that nothing is right for everyone and everything is right for someone. This belief comes from an understanding that each of us is unique. Simply put, each of us is biochemically different with different hormonal, enzyme levels and neurotransmitter levels. Each person reacts to the world in different ways. If we are all different, why would we even consider the idea that there must be one program of nutrition that is best for everyone? Where did the idea come from? The united states department of agriculture publishes daily recommended allowances of vitamins and minerals. For decades people have taken these guidelines as the “bible” and carefully read food labels to understand how much of each nutrient they are getting. The american heart association also publishes recommendations for the amount of fruits, vegetables, grains and dairy produts people should consume. People routinely use these guidelines to see how they measure up. These guidelines are based upon statistical models of the “average american” and research based in “current science.” The problem with statistical models is that the average american is a myth found only in statistical research papers. In real life, individual needs can vary significantly. Meanwhile, current science is simply the best conclusion that can be made given available data. The problem with “current science” is that it is quickly outdated and never complete as new information is constantly being gathered. What is accepted as the truth today is often found to be wrong tomorrow. A good case in point is the intake of cholesterol. While america has become obsessed with lowering cholesterol intake, studies published over the last couple of years in the prestigious british medical journal reveal that low cholesterol numbers, while protecting against cardiovascular disease, seem to increase the risk of certain cancers. In addition, supplements and herbs once thought to be “quackery” are now observed to have complex biochemical interactions beneficial in a wide variety of conditions. What should a person do? there are many ideas on the bookshelves about how to eat and stay healthy. There are diets named after the people who wrote the books, diets named after the foods eaten, diets named after blood types and diets that promise to keep you in the “zone”. New books and ideas are published every month. Ayurveda is a 5000 year old science that aims to help a person understand what is right for them as a unique individual. By evaluating how a person’s digestive system, nervous system and other systems of the body function and by evaluating a person’s body structure, a clinical ayurvedic specialist designs a diet specific to clients needs. Ayurvedic science teaches that people who have a “vata” nature, or those people who are thin, dry and often feel cold, need more grains, oils, salt and a little spice in their diet. Those who do not receive enough are prone to anxiety, constipation and sleeplessness among many other conditions. They need nourishing foods and often have difficulty maintaining a vegetarian diet. People of vata nature should avoid too many salads and fruits as well as beans and take in more grains, dairy and nuts. People of “pitta” nature, or those who tend to be warm and have a more intense and highly focused nature, are understood to need more raw vegetables and food which are only mildly spiced. hot, spicy food is believed to lead to a greater incidence of skin rashes, liver weakness and anger. Large salads would do wonderful to them. People of “kapha” nature, or those who tend to be overweight or stocky and often move and speak very slowly, benefit from lighter foods such as vegetables and salads and thrive on hot, spicy foods. if sweet, heavy, oily foods are taken in too great of a quantity it can lead to greater mucous accumulation as well as further weight gain and diabetes mellitus. People with a kapha nature should avoid all sweets, dairy and nuts and most grains such as wheat and rice. However, grains such as quinoa and millet can be taken. Nothing is right for everyone, everything is right for someone. 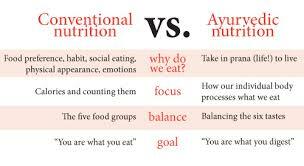 Ayurveda avoids the “everybody must” dogma in favor individually tailored food programs to meet the needs of individuals. With a proper diet and lifestyle, ayurveda’s goal is to help each person reach their maximum potential, physically, emotionally and spiritually. worst foods– hot, spicy foods, sour foods, deep fried foods, fermented foods such as yogurt and vinegar. quality websites on the internet. I’m going to recommend this website! I m suffering anxiety and looking for tips on diet for Vat prakruti. Got the same in simple language…Thx. An admirable article, an eye opener to our oldest and true medical science. Can u please put light how can we check as to whome catagory we actually fall. I tried to test myself but not fit to any, infect having everything (something) of every one yet not any one specific of these three. Niether the overweight nor the under one I am 5’10” and my weight wave in between 67 to 76. Constipation was a problem of last 20-25 years and went for a piles surgery. Easily fall for cold especially every change of season bring a stroke of fever for me. Mentally a self questioning guy a type of day dreamer and imaginative difficult to be a practical to world yet I am a practicall one to a large matters. some times feel acidity and frequently got accidents since childhood. Now please let me know how can We judge ourself as to what catagory we fall.